We provide innovative dust control technologies to suit your application. Our approach is wholistic in that we will look to solve your issues from a number of angles. 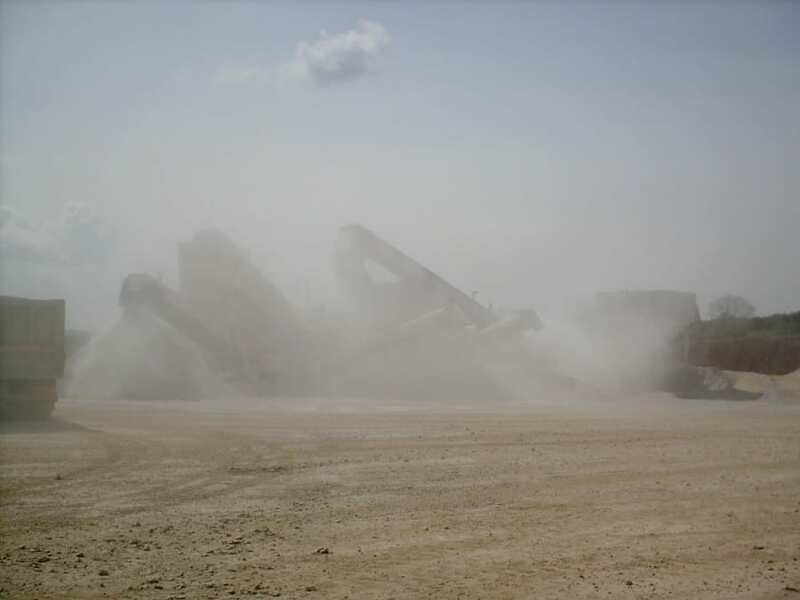 Dust can escape when dry material is conveyed, crushed or screened. There are a number of localised dust suppression measures that you can employ to reduce fugitive dust emissions. Water based solutions such as high and low pressure fogging systems at each location where dust escapes the process. Dust containment solutions combined with fogging control the airflow to effectively clean the dust laden air escaping from transfer points. Wet and dry dust extraction at transfer loadout or crusher locations. These systems are bespoke, designed specifically to suit each application. The transport of material from the mine or quarry face to the primary crushing or screening plant by haulage vehicles can also contribute to dust emissions. Traditional short term haul road dust suppression tends to be water deployed from a bowser. The water suppresses the dust for a short period of time until the water has evaporated. Once this happens, dust clouds begin to rise. The haul road is further dried by the crushing action of the dumper and loading shovel tyres and exhausts. More long term solutions are available using wetting or binding agents to ensure medium to long term dust suppression of each haul road. Waterbased solutions can be employed to suppress wide area dust emmissions. Dust control cannons and rain guns can cover large areas and effectively suppress dust with rain. Smaller sprinkler systems can be used to cover smaller areas and roadways. Wetting and binding additives can reduce dust escaping from stockpiles by effectively sealing the outer surface of the stock pile. During the waste recycling process dust can be produced during conveying, offloading and moving and by screening and shredding waste material. The dust produced during this process can reduce visibility and can be a hazard to both staff and machinery. Water based solutions comprising either high pressure nozzle fogging systems or low pressure rotary atomiser systems can be effective in controlling dust emanating from this type of operation. Wet and dry dust extraction can also be an effective way of removing dust at transfer points and shredding and screening locations. These systems will be specifically designed to suit each application. We aim to provide innovative fire suppression solutions to wood and waste recycling, quarry and mining companies, port authorities, waste water treatment, food and plastics companies. We will work with you and your process to solve the issues you have. Our process involves looking at your site in a wholistic manner and determining the best solution for your specific application. We are not tied to one technology and can provide, dust suppression, dust containment and dust extraction solutions to meet your specific needs. PCPgroup design dust control solutions that are a combination of containment and suppression and extraction. For materials and fuel handling, mining, mineral and aggregate production, where excessive wetting of the conveyed material would cause problems, our foam dust suppression system is the answer by using minimal quantities of water to effectively suppress dust throughout the whole production process. Only 2 litres of water is used per tonne of material being conveyed. Our MINIAT rotary atomisers and XL Dust cannons provide significant dust suppression over large areas for waste recycling facilities and construction sites and can be deployed easily rapidly. Where a rotary atomiser or XL Dust cannon solution is not an option, the MINIAT Fog high pressure nozzle fogging line provides an effective and easily deployed, fence line dust suppression system. Our dust extraction solutions are designed to suit the application. Dry for most and wet where explosive or hazardous dust is being extracted where space is an issue. We also provide a range of binding and wetting agents for longer term dust suppression combined with an expansive range of rain guns and sprinklers.